Hazel – Dig Delve – An online magazine about gardens, landscape, growing & making. 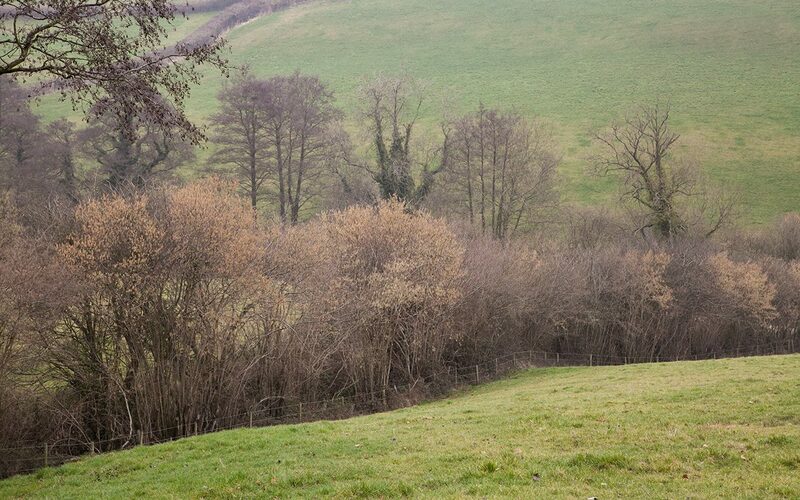 We have half a dozen mature hazels (Corylus avellana) that survived here for being out of reach of the grazing. 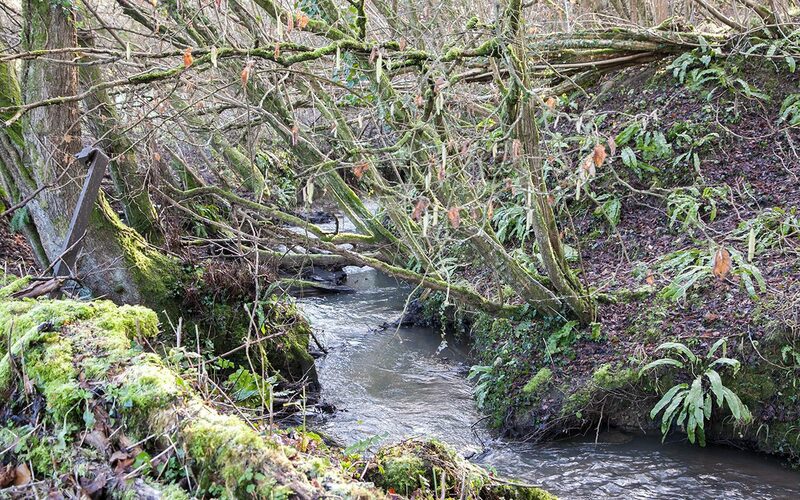 They cling to the banks of the brook opposite our neighbour’s wood and were protected by a run of barbed wire that kept the cattle from the brook’s edge and, in turn, provided the trees with their own little sanctuary. Their domain, very sensibly, was over the water and into the shade, but it is remarkable how quickly a change of regime is marked in growth and, in the eight years without the cattle, their limbs have reached back over our land so that that you now have to duck as you approach. In their shadow I have been planting snowdrops, which like the moisture there in the winter and the drier influence of their roots in the summer. 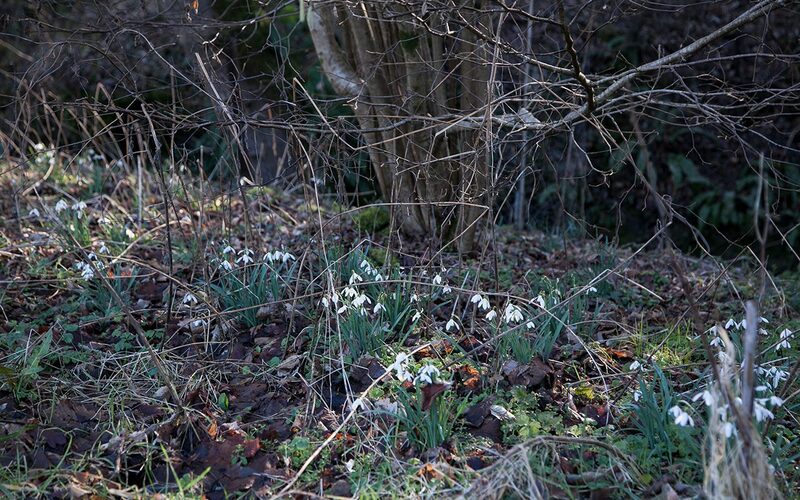 The pools of catkin and snowdrop have made new places that we are drawn to explore when the winter is with us. 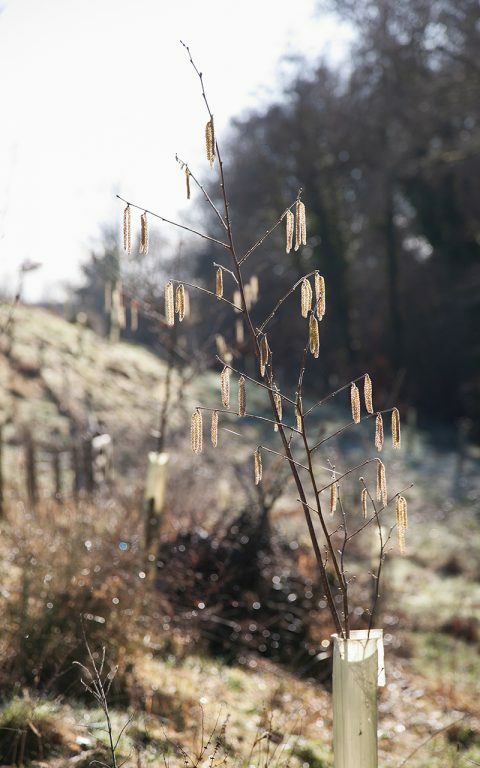 Look down now on the wood from our perch on the hillside and the pale golden cast of the catkins reveal where the hazels run. Happy to live in the understory of the tall poplars above them, their rangy limbs topple like collapsed scaffolding where they have gone without coppicing, but you can read their preference for the hinterland. At the edges of the wood and where they step out from the high canopy and finger up the brook in the open crease at the bottom of the slopes, they look most contented. The billowing outline of one tree running into another reveals their true character and shows you where they thrive. Huddled on the edge of the wood where it is still and moist and sheltered. Walk the line of the hedges up the slope away from the wood and you find hazel here too. Nuts that were buried by squirrels and forgotten, but happy to be part of the hedgerow and its community. 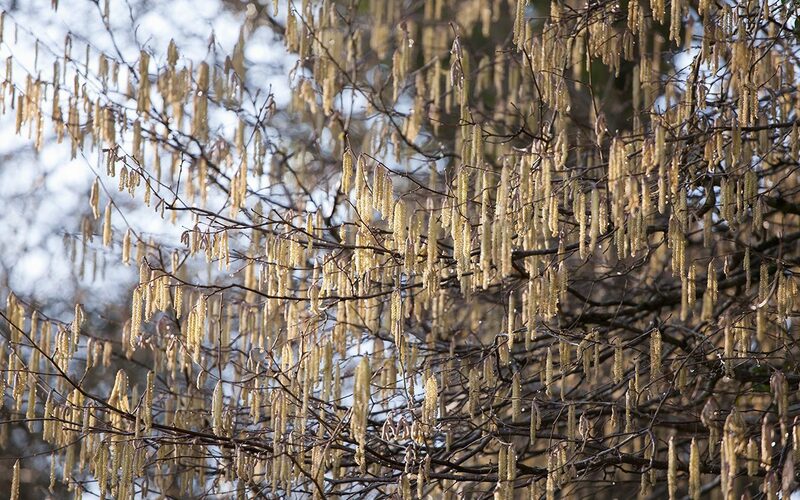 It is impossible to tell the age of the hazels that sit in the hedge, for they will take a regular cut and regenerate as a shrub rather than a tree, but they are probably as old as their cousins in the wood. Further up the hill again, where some of the hedges along the ditch were nothing more than a twist of barbed wire and bramble, it is often the hazel that has outlived its neighbours. By disentangling the wire from the bushes that had been habitually scalped by the flail and then kept in check by the cattle, a number have been freed and left to regenerate. Although you can see the previous brutal regime in their eldest limbs, they have shot from the base as hazels do and, in just eight years, we have the beginnings of a new grove. Where I come from on the South Downs, the ancient coppices contain trees that are thought to be as much as a thousand years old. The original stumps have rotted away from the middle, but you can see the oldest plants in the coppice mapped in the close groupings of offsets that have radiated outward over time. New trees that have been deliberately layered (that is, rooted by bending the longest shoots to the ground and weighting them with a stone) stand at a sensible distance of about eight strides to give them room enough, but still with the company they need to draw new growth up and straight towards the light. Coppicing extends the life of a tree and the industry around it traces our woodland symbiosis in a long and unbroken line of charcoal production as well as material for hurdles, furniture and building. 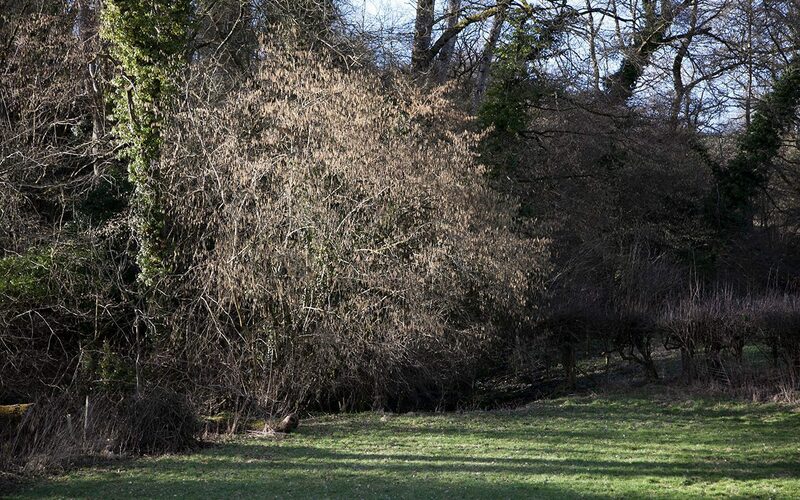 Cut on an eight to twelve year rotation, a hazel coppice will regenerate fast, the trees touching again in four or five years, but not before a valuable interlude of light has been allowed to reach the woodland floor. Ephemeral woodlanders such as foxgloves seize this window of opportunity and bluebells, wood anemone and primroses take the chance to build up their strength before being cast once again into more permanent shade. 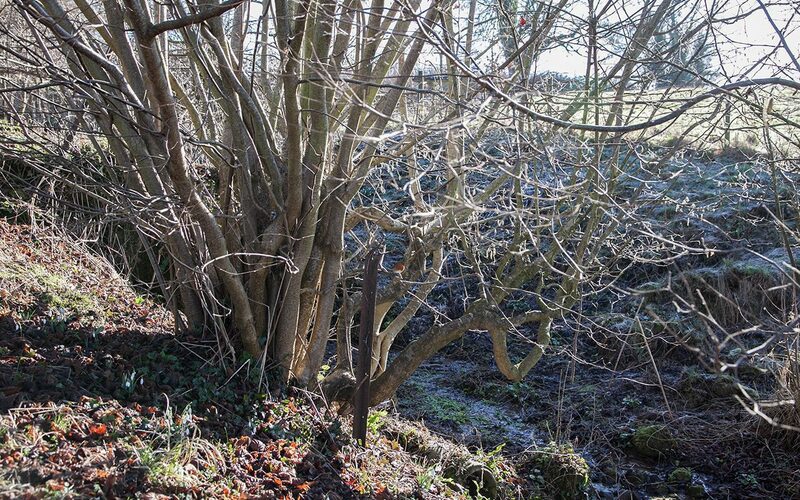 The best material from coppicing, which retains its pliability, is cut at the beginning of the winter. Later cuts between January and March produce wood that is prone to brittleness. The finer top growth is used for pea sticks, faggots and withies. The rods, which can run straight to four metres, are either split and used for hurdle making and building materials or, in my case, for plant supports in the kitchen garden. A twelve year rotation will also produce firewood. 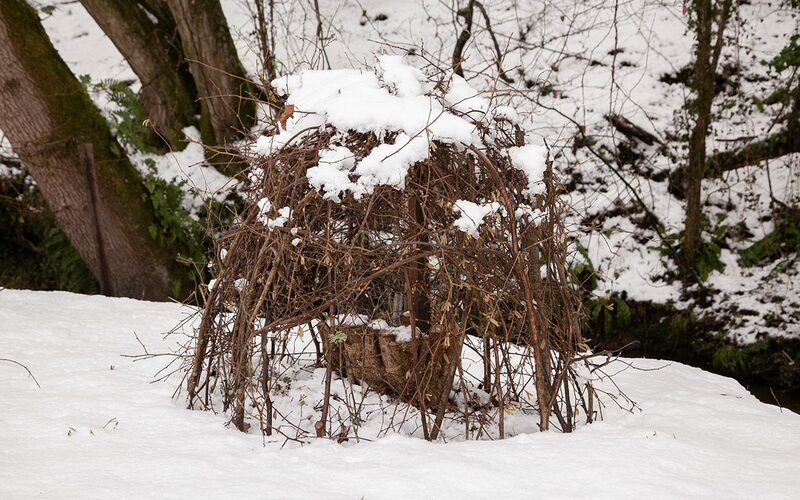 The brash and less useful brush is piled or woven over the coppiced stump to prevent the deer from nibbling the regenerating shoots. A year will see new growth push clear of the grazing line before the brash has rotted and returned to the ground. In the second winter here, having seen where the wild trees were happiest, I planted a grove of filberts and cobs below the new orchard. Cobs are Corylus avellana selections, filberts Corylus maxima. 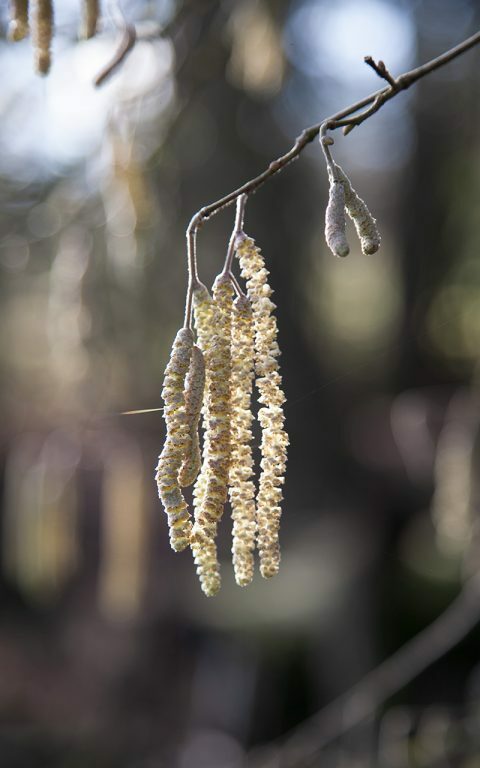 Though very similar in appearance to the native hazel, they are chosen for their superior nuts and are distinctive for their crested outer calyx. There are twenty one trees, three of each of seven varieties; ‘Webb’s Prize’, ‘Gunslebert’, ‘Kentish Cob’, ‘Cosford Cob’, ‘White Filbert’, ‘Butler’ and, naturally, ‘Pearson’s Prolific’. Though to date the squirrels have stripped them just days before we consider them ripe enough for our own consumption, we remain hopeful that in time we will get enough nuts to go round. 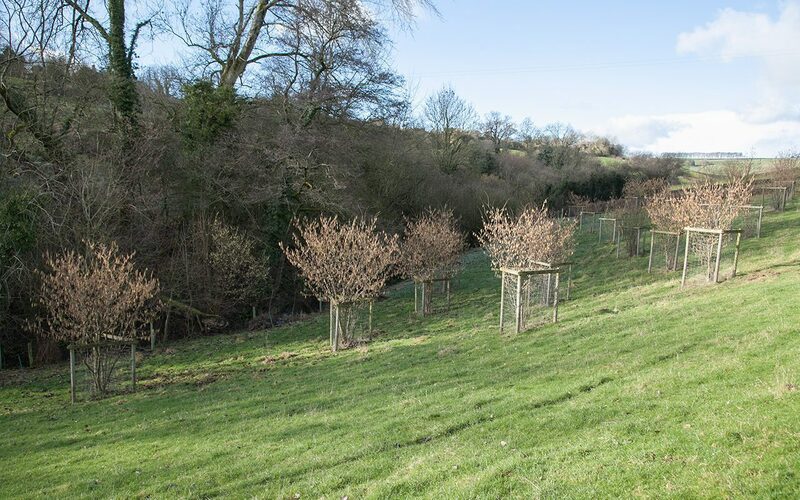 Staggered in an informal grid of eight metre spacing, the trees sit in grass and take the formality of the orchard down to meet the wood. For now they are protected with tree guards, so that I can let the sheep graze amongst them, but in time, when the canopy closes over, I will fence the nuttery in and bring the woodland floor into this area. Further downstream, a new informal coppice of straight hazel is set to join the mature trees that run the length of the stream. In five years’ time I am hoping they will be big enough to coppice. A cycle which may be repeated many times in the life of these young trees. Only a handful of times by me, but hopefully many more with their legacy.